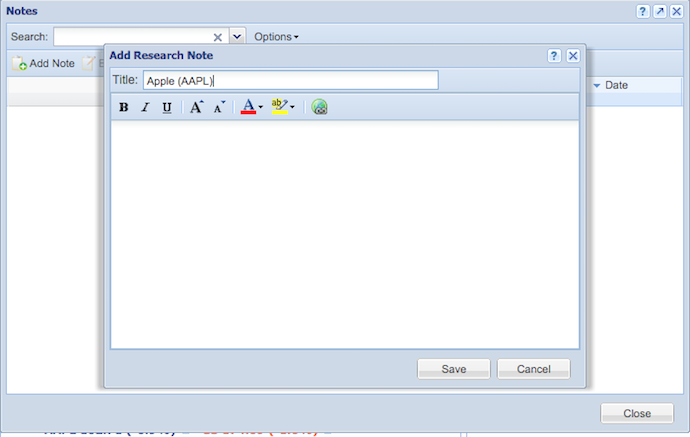 This will bring up a window where you can format the note. The ticker is automatically added as the title, but you can rename the note if you’d like. The second way to add a note is from the start menu. Click the ‘Open Notes’ button, which opens up the window below. The ticker of the stock selected in the table is automatically added as the title. To find a note, you can search for it in the search box. 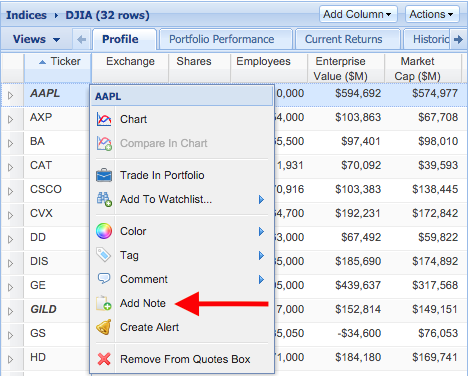 If you click the ‘Options’ button, you can select to have notes automatically search for the stock selected in the table. You Can also choose to make the search case sensitive, and elect to make it match any word in the search box, all words, or the exact phrase. Click the ‘x’ at the end of the search box to see all your notes listed. From here you can browse through your notes, or search for any word in the body or title of the note. You can also filter the notes by date. To do this, right-click the Date column header and mouseover the ‘Filter’ option. Here you can choose to see notes created in a certain time period.